Baños Spanish Center was the first language school in Baños and has operated for more than 25 years. The Center is ideally situated near the center of town, has spacious classrooms, and a beautiful garden. We recommend and can organize your stay with a local family in Baños de Agua Santa. Homestays are excellent opportunities to practice your Spanish and learn about local happenings as well as customs and traditions. From sharing meals to being invited on weekend trips you will feel like part of the family. Many students form bonds that last for years. 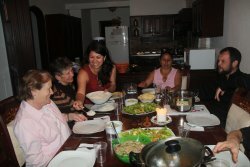 All homestays are within walking distance of Baños Spanish Center and include two or three meals daily. We can also arrange for you to stay in an apartment or hostel depending upon your preferences. Hostels cost between $10 and $20 per night.